My friend Molly also bought me some 'squid balls' to try. I have included a picture below. They were delicious! They were a dough type ball with squid and veg inside. The topping was Taiwanese mayonnaise (this is much sweeter than mayo back home), with powdered seaweed and dried onion (I think) on top. 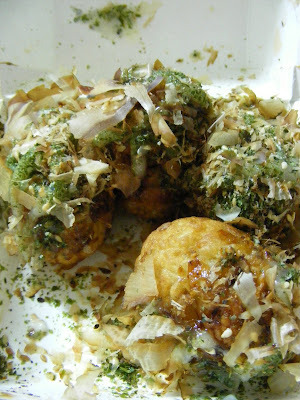 Here is a picture of the squid balls. 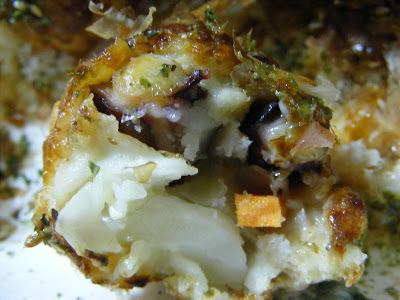 Here is a close up of the inside of one of the squid balls. 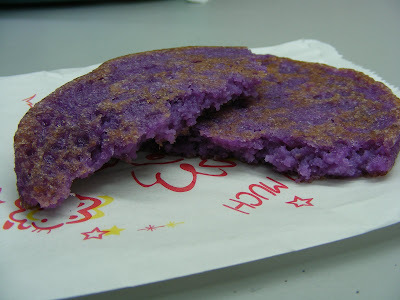 One day, on the way to work, I saw a vendor selling these flat cake thingys. I thought they looked so cool because they are purple! I'm told it is sweet potato with some kind of colouring from a vegetable (I can't remember what gives it the colour). It was sweet on the outside because it had been fried with sugar, but once you bit into it, it wasn't sweet. It was quite a strange taste sensation, but still a pleasant one.